Chongqing Lifan, one of China's biggest private motorcycle manufacturers introduced its first passenger car last week. Called the Lifan520 this new compact sedan is powered by a 4-cylinder 1.6-liter petrol engine supplied by Tritec of Brazil. 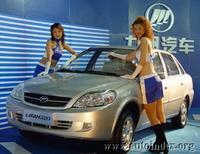 It is the same engine as found in the Mini Cooper and the Chery Fengyun. Main dimensions are: 4370x1700x1473 mm, kerb weight is 1155 kg. 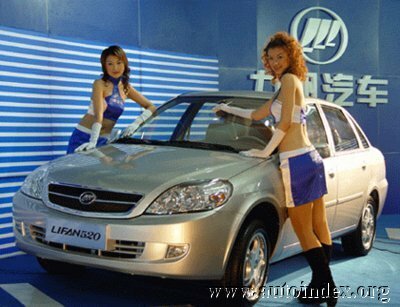 Production line of Lifan 520 was developed with assistance from Hainan Mazda, while design and engineering assistance was provided by other FAW subsidiaries. Another body style, a five-door hatchback will join the lineup later this year. Domestic launch will commence in June, with exports to start later this year. According to official information, the company has signed an agreement with an Iranian automobile rental company on the import of 500 vehicles. 2005-04-04 Please quote Autoindex.org if You use this news article!